NADH, short for nicotinamide adenine dinucleotide, is an important pyridine nucleotide that functions as an oxidative cofactor in eukaryotic cells. NADH plays a key role in the production of energy through redox reactions. NAD serves as a cofactor for dehydrogenases, reductases and hydroxylases, making it a major carrier of H+ and e- in major metabolic pathways such as glycolysis, the triacarboxylic acid cycle, fatty acid synthesis and sterold synthesis. How does it reduced the activation energy of a reaction? Enzymes accelerate reaction rates by bringing substrates together in an optimal orientation. By setting the stage for making and breaking bonds, cofactors stabilize transitions states. Transition states are the highest-energy species in reaction pathways. By doing this selectively, the enzyme determines which one of several potential chemical reactions actually occurs. Nicotinamide adenine dinucleotide (NAD) is one of the most important coenzymes in the cell. Not surprisingly, NAD and the closely related NADP are the two most abundant cofactors in eukaryotic cell. Healthy bodies make all the NADH they need using vitamin B3 (also known as niacin, or nicotinamide) as a starting point. The NAD coenzyme acts as a hydrogen acceptor in oxidation-reduction reactions. The electron transport chain in cellular respiration is responsible for energy production and is an excellent illustration of NAD's involvement in redox reactions. NAD participates in many redox reactions in cells, including those in glycolysis and most of the reactions in the citric acid cycle of cellular respiration. This site shows three examples of oxidoreductase enzymes (an oxidase that uses molecular oxygen as the electron acceptor) that use NAD as a cofactor to catalyze a dehydration reaction. 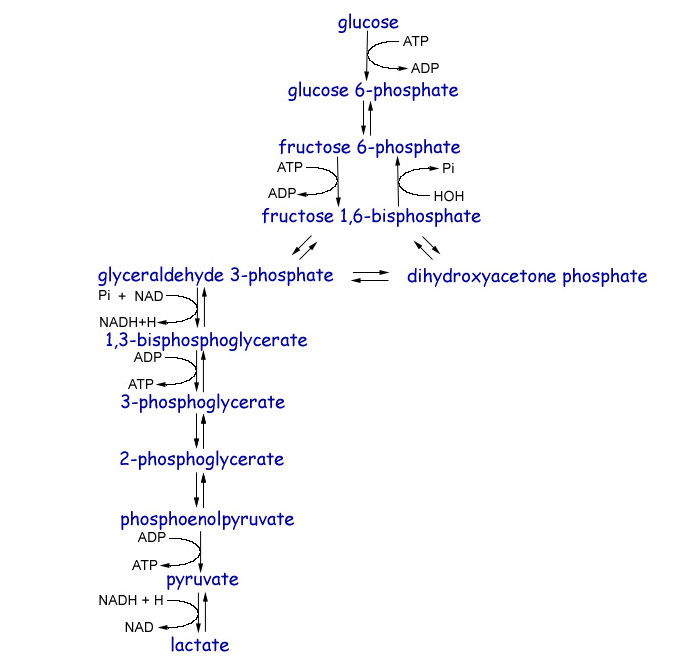 Follow the links below to see how Alcohol Dehydrogenase, Glyceraldehyde-3-Phosphate Dehydrogenase, and Lactate Dehydrogenase use NAD to accelerate the reactions they catalyze. Megan Clarey Fall 2001 Chem 406.